Marseille struck twice in the closing five minutes to overcome Bordeaux and return to the top of Ligue 1. Marcelo Bielsa's side lost top spot when Paris St-Germain won on Friday and fell behind to Thomas Toure's finish. But Mario Lemina nodded Marseille level on the hour and Andre-Pierre Gignac thrilled the Stade Velodrome with another header five minutes from time. Michy Batshuayi tapped in with a minute to play to seal a sixth straight home win in a thrilling finale. His simple finish sparked relief - as if Toure and Wahbi Khazri had shown more composure with chances when the score was at 1-1, Bordeaux could have snatched a first win at Marseille since 2008. Ginac's 11th league goal of the season punished their poor finishing and Bordeaux slipped to fifth in the league behind Nantes, who drew 0-0 with St-Etienne earlier in the day. Match ends, Marseille 3, Bordeaux 1. Second Half ends, Marseille 3, Bordeaux 1. Corner, Bordeaux. Conceded by Steve Mandanda. Attempt saved. Billel Omrani (Marseille) right footed shot from the left side of the box is saved in the centre of the goal. Assisted by Dimitri Payet. Attempt missed. Diego Rolan (Bordeaux) header from the left side of the six yard box is close, but misses to the left. Assisted by Jaroslav Plasil with a cross following a set piece situation. Foul by Billel Omrani (Marseille). Thomas Touré (Bordeaux) wins a free kick on the right wing. Attempt blocked. Grégory Sertic (Bordeaux) right footed shot from outside the box is blocked. Assisted by Jaroslav Plasil. Goal! Marseille 3, Bordeaux 1. Michy Batshuayi (Marseille) right footed shot from the centre of the box to the bottom right corner. Attempt saved. Rod Fanni (Marseille) right footed shot from outside the box is saved in the bottom left corner. Attempt saved. 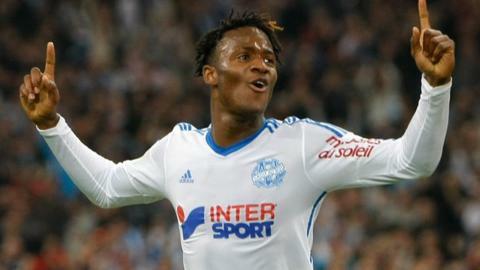 Michy Batshuayi (Marseille) left footed shot from the left side of the box is saved in the centre of the goal. Assisted by Dimitri Payet with a cross. Foul by Giannelli Imbula (Marseille). Grégory Sertic (Bordeaux) wins a free kick in the defensive half. Diego Rolan (Bordeaux) wins a free kick on the left wing. Substitution, Marseille. Billel Omrani replaces Florian Thauvin. Goal! Marseille 2, Bordeaux 1. André-Pierre Gignac (Marseille) header from the centre of the box to the bottom left corner. Assisted by Dimitri Payet with a cross following a corner. Corner, Marseille. Conceded by Mariano. Foul by Thomas Touré (Bordeaux). Corner, Bordeaux. Conceded by Florian Thauvin. Attempt blocked. Diego Rolan (Bordeaux) right footed shot from the centre of the box is blocked. Assisted by Jaroslav Plasil. Foul by Diego Rolan (Bordeaux). Substitution, Bordeaux. Diego Rolan replaces Wahbi Khazri because of an injury. Delay in match Wahbi Khazri (Bordeaux) because of an injury. Attempt blocked. Wahbi Khazri (Bordeaux) right footed shot from outside the box is blocked. Mariano (Bordeaux) wins a free kick in the defensive half. Giannelli Imbula (Marseille) wins a free kick in the attacking half. Foul by Abdou Traoré (Bordeaux). Substitution, Marseille. Michy Batshuayi replaces Abdel Barrada because of an injury. Delay in match Abdel Barrada (Marseille) because of an injury. Attempt missed. André-Pierre Gignac (Marseille) right footed shot from the right side of the box misses to the left. Assisted by Giannelli Imbula. Attempt missed. Wahbi Khazri (Bordeaux) right footed shot from the centre of the box is too high. Assisted by Nicolas Pallois. Foul by Mario Lemina (Marseille).